D.E. Walker started the Visalia Stock and Saddle Company in 1870 in Visalia, California after buying out an existing saddlery business started in the 1860s. 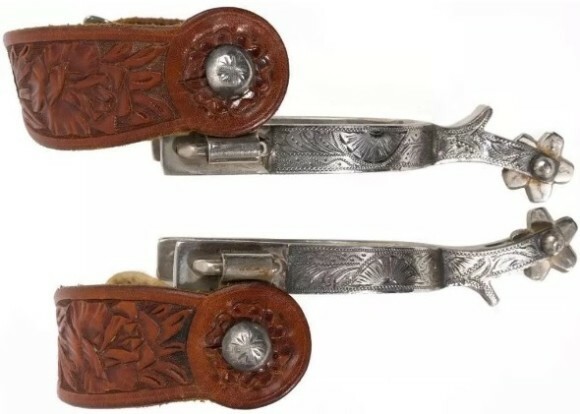 The company would move to San Francisco in 1887 and was primarily known for its saddles, but its catalog also carried other supplies and tack, including bits and spurs as well as saddlery hardware like conchos, buckles, and other silver items. Visalia employed expert craftsmen and some of their bits and spurs are among the most valuable on the collector’s market. The company has been bought and sold numerous times through the years passing hands through at least 8 owners and is still currently selling saddles, bits and other goods. The most famous of the Visalia products is the Visalia Humane bit which is very popular with riders and is still produced today. Visalia contracted out its production of bits, spurs and silver items and gave maker’s mark stamps to its makers. There are quite a few different designs that were used over the years but some are shown on our Marks page. Click here for information on Visalia Maker’s Marks.